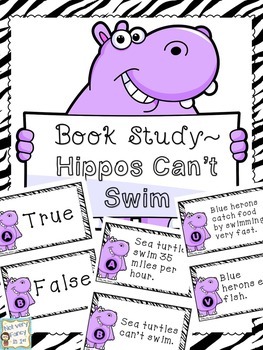 The first time I read Hippos Can't Swim, I was in love. I think it’s highly engaging and beautifully illustrated. 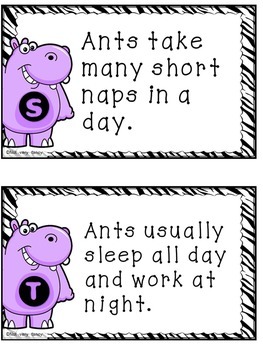 I love the way the author compares and contrasts the animals. I wanted to design a lesson to use the text and develop critical thinking skills. 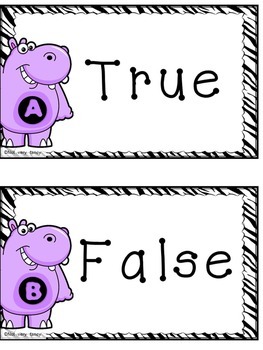 I took the fascinating facts from this text and made a set of 26 true/false questions. The questions are half page sized to use in a whole group lesson, or small-sized to use individually. 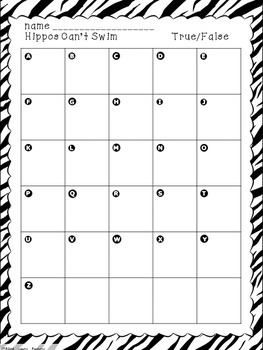 There is a recording sheet and an answer key. These materials are aligned to CCSS for grades 1-4. Teachers can vary the difficulty, according to their student's needs. I've included a page of suggested uses. I suggest using the true-false statements before reading to establish purpose and activate schema, then revisiting the statements after reading and using textual evidence to sort the statements. The heart of this lesson is in the discussion between students as they defend their thinking—first based on their schema, then based on textual evidence. It isn’t important for students to master the content in this text (how many babies a rabbit has in one summer). What’s important is for them to be able to use the content to prove their answers. The intention of this activity is to use this text as a fun vehicle to learning how to use textual evidence to explain or prove their answers. Looking for more literacy visuals, centers, activities, and lessons? Thanks for visiting my store! I would really appreciate feedback on any product you download. Be sure to follow for information on freebies, sales, and new products.